If you think 30°C is hot, you clearly haven’t been to Kuwait yet! The country is well known for being one of the hottest places on the planet with temperatures regularly going beyond 50°C (!!!) during the summer months. To take advantage of the blazing heat, Burger King developed their very own solar powered cooking surface to produce ‘Sun Flame-Grilled Whoppers’. The burger is available in selected stores in Kuwait whenever the temperature rises above 50°C and aims to encourage Kuwait’s citizens to beat the heat and have fun despite the extreme temperatures. What a great idea! Nothing beats an ice cold beer on a warm summers day! Unfortunately, the alcoholic beverage is seen as inappropriate in many day-to-day situations – like during a business meeting or whilst driving. But thanks to Heineken ‘Now you can’! In order to promote its new non-alcoholic beer, the brand takes a comedic approach to the topic in their latest ad campaign, by showing people enjoying a beer in situations where they normally shouldn’t. The short clips take an unexpected turn, when the protagonists manage to embarrass themselves in a completely unrelated way. In the ‘parking’ ad, a man is drinking beer in his car when a police officer approaches him and writes out a ticket. The man quickly points out that his beer is non-alcoholic, however, the ticket was not for the alcohol but for his illegal parking. The fun campaign points out that being sober doesn’t necessarily stop you from looking stupid. Another beer brand has made it into our top 5 summer campaigns! To parody Protein World’s controversial ‘Are You Beach Body Ready?’ campaign, Carlsberg asked its audience if they were ‘Beer Body Ready’ instead! The amusing ad attempted to build people’s confidence and reassured its audience that they don’t need a perfect body to enjoy a beer at the beach – and we think that’s great! Summer can be a tough time for some businesses that aren’t seasonal and can often mean a slow down in sales and dead stores. To avoid this, IKEA placed their furniture directly where people like to spend their summers: To celebrate the 30th anniversary of the Billy bookcase, the Swedish furniture retailer put up 30 red bookcases on Australia’s Bondi beach, filled with thousands of books ideal for beach reading. On a hot summer day, sometimes all you really want is an ice cold soft drink and a nice cool shower to cool you down. 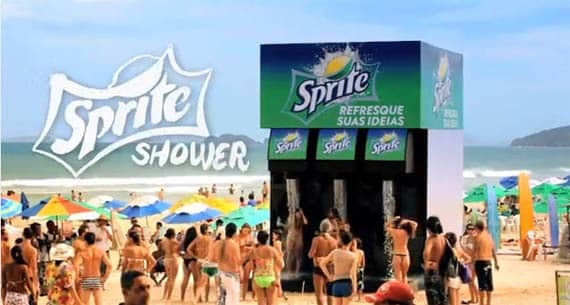 ‘Why not combine the two?’ thought soft drink brand Sprite and put up a giant soda machine shower on a beach in Brazil, which encouraged people to stand where the cup would usually go. The outdoor marketing campaign was a great success and showered more than 1,500 people each day the giant machine was in place. If you are looking for creative ideas for a new marketing campaign contact CuCo today on 01202 911959 or email us at hello@cucocreative.co.uk – We’d love to help!